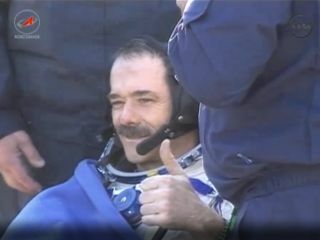 Canadian astronaut Chris Hadfield gives a thumb's up sign after successfully returning to Earth on May 14, 2013 (May 13 EDT) aboard a Soyuz space capsule following a five month mission. Hadfield commanded the Expedition 35 mission to the International Space Station. LONGUEUIL, QUEBEC — "It's a boy!" exclaimed astronaut David Saint-Jacques as he watched on TV while his colleague, Chris Hadfield, slowly emerged from a Soyuz spacecraft late Monday (May 13). The astronaut's quip drew laughter from 250 tweetup attendees in an auditorium at the Canadian Space Agency's headquarters near Montreal, Quebec. Another 50 people overflowed into the nearby cafeteria. While the party took place several thousand miles away from the safe landing of Hadfield, NASA astronaut Tom Marshburn and cosmonaut Roman Romanenko on the steppes of Kazakhstan, the CSA served as command central for Canada's celebrations. Chris Hadfield launched toward the International Space Station on Dec. 19 with about 20,000 Twitter followers to his name and returned Monday night with roughly 45 times that number — 880,000-plus people. That celebrity status, Saint-Jacques told SPACE.com, reflected not only Hadfield's hard work but also the efforts of the agency's media relations team and thousands of others on the ground. Hadfield's history-making time in orbit also doubtless played a part. He led the orbiting lab's Expedition 35, becoming the first Canadian ever to command a space station mission. Hadfield's skyrocketing fame made the Canadian the visible top of a support team helping him get the message out about space through tweets, videos and a variety of events. Tweetup attendees at Canadian Space Agency headquarters near Montreal applaud astronaut Chris Hadfield's extraction from the Soyuz spacecraft on May 13, 2013. Many of Hadfield's viral videos — cutting his nails, for example, and making a pita sandwich — were prewritten scripts created through the CSA's publicity machine. Tweets and other social media updates went out with the assistance of Hadfield's son, Evan. Additionally, there were organized live eventssuch as concerts and science activities that involved entities such as the Canadian Broadcasting Corp. (the national broadcaster in Canada) and Let's Talk Science, a charitable organization aiming to interest children in technical fields. That's not to say Hadfield didn't work hard himself, of course. His humility and sense of humor — he made Starfleet jokeswhen talking to "Star Trek" actor William Shatner, for example — brought the message of space to thousands. "He made space understandable. That might be where he is most successful," Saint-Jacques said. Within NASA, outreach is regarded more as a bonus than a requirement on space station missions, Saint-Jacques added. The agency is more focused on ensuring the health of the crew, maintaining the station and also measuring the science performed during each expedition. On those criteria, though, Hadfield's command of Expedition 35 also drew positive headlines. On Saturday (May 11), the crew completed a tricky emergency spacewalk to fix an ammonia leak, after NASA created a plan for the work in record time. Former astronaut Robert Thirsk (left) and astronaut trainee David Saint-Jacques describe the Expedition 35 landing for tweetup attendees at Canadian Space Agency headquarters near Montreal. Additionally, Hadfield's crew did an unprecedented amount of science on their increment as a percentage of work on the station. While Saint-Jacques did not have the exact number available, he estimated it was about 20 percent. "The station takes a lot of maintenance," Saint-Jacques said. Hadfield was slated to arrive at NASA's Johnson Space Center on Tuesday (May 14) and spend the night in crew quarters before going to his family home in Houston. The energetic 53-year-old will have to take things a step slower during his first days back, added Thirsk, a Canadian who spent five months in space in 2009 aboard Expedition 20/21. "When he comes back home, he will change from a space creature to an Earth creature," Thirsk said, explaining that there will be physical rehabilitation and the need for Hadfield to bring himself back into his family affairs after several months away. Thirsk compared an astronaut's return to his or her family to a group of people paddling a canoe. "At some point, you leave the canoe and you take different responsibilities," he said of astronauts, adding that the challenge is figuring out how to pick up the paddle again when you return.